Christian Pictures of "Six Famous Symbols of Christianity"
Click Picture above for enlargement and history! Henry Parry Liddon was a contemporary of Charles Spurgeon and Joseph Parker, and was heard gladly by thousands every week at St. Paul's Church in London. An able scholar, he served on the faculty of Oxford and other schools throughout his life. Liddon's sermons and writings took on the errors of his day like the higher criticism and Unitarianism. He stood against compromising ministers and exposed them, refusing to preach in their churches. He never married and considered the ministry his 'wife.' He loved preaching from the Old Testament and extolled its trustworthiness for Christian doctrine. Those who heard him preach described his style as "striking, penetrating and magnetic." Those who knew him personally said that his personal devotion to Christ was what made his preaching so powerful. His sermon manuscripts are unique and still worthy of study. McCheyne was another Scottish divine who soared high in the spiritual realm of preaching in only 30 years of living. He was a gifted child, learning the Greek alphabet at four years old and graduating from University of Edinburgh at fourteen. He pastored over 1000 people at St. Peter's of Dundee and preached in many extended meetings. His ministry stressed missions, and it was on a mission trip to Palestine that he became extremely sick. His health was frail all his life. One of his nuggets of wisdom, "Live so as to be missed" is an appropriate description of his life, as his preaching is still blessing others to this day. Known as the American Spurgeon, Talmage was born in New Jersey. Converted at eighteen years old in a revival meeting, he pastored in Brooklyn and was known as an emotional and passionate preacher. When warned that his gospel message might deny him the best pulpits, he said, "If I cannot preach in America, I will go to the heathen lands and preach." He was aggressive, not concerned with the feelings of his hearers. His central message was the Christ, His love and sacrifice. He once said, "I shall take all of the Bible, or none." Many criticized his theatrical pulpit style, but not his results. He was not a true expositor, as many on this page, but he was full of zeal and passion, and thousands responded. He was orthodox in his doctrine, never wavering from historic Christianity, and his sermons still touch people today. England's Charles Kingsley preached his first sermon at four years old. The son of a preacher himself, he was a prodigy. He was robust in his studies and his preaching. He was a writer of poetry, drama and novels; his novel Westward Ho is still considered a classic even today. He once wrote that false religion was "the opiate of the people." Karl Marx seized upon the phrase and famously labeled all religion by the title. Kingsley ministered in poor areas and identified with his people's needs. He was a champion for social change in England. Kingsley had a love for the Bible and loved to expound it. He fought against the compromise and error of the day, but did embrace Darwin's theory of evolution and corresponded with Darwin regularly. His success in writing led him to friendships with with great authors of the day, like Whittier, Harriet Beecher Stowe and William Cullen Bryant. He was considered a good and godly father and husband, traits not as plentiful among preachers as they should be. Kingsley is not well known in our day, but deserves to be read. Walter Maier held a doctorate in philosophy from Harvard and taught at Concordia Seminary in St. Louis, but is best known for his worldwide radio broadcast, Bringing Christ To the Nations. He was heard in over 120 nations and by over twenty million souls. He was a Lutheran at a time when his denomination was denying the old time religion. He stood true, extolling the reliability of Scripture and man's need for the sacrifice of Christ. His preaching was inspiring and direct. Early in his ministry he won the Billings Prize in Oratory and used all of the rhetorical tools of the good communicator. Billy Graham called him the greatest evangelist of the 20th century. In the face of harsh opposition, he never dipped his colors or compromised his principles. George Whitefield was one of the most original preachers in the history of the church. With a powerful and dramatic style, this Englishman has been called the greatest preacher since the Apostle Paul and the Demosthenes of the pulpit. His preaching in the US was a main cause of the Great Awakening. A master of imagination, metaphor, and drama, it is said that his delivery was like that of a a great actor. He was a protégé of the Wesleys and Methodism, but moved away from their theology toward a more Calvinist position. Though he died at 56 years old, the world is still feeling the impact of his life. His sermons are available on many internet sites and all are worthy. The fourteen messages below are representitive of his ministry. Some say that Jonathan Edwards was the most powerful and most effective preacher ever heard on the American continent. He is generally regarded as America's first "great mind." He was a scientist, philosopher, author, educator, and preacher. Edwards embodies puritanism to most people today and his sermons are still published and read widely. His belief in the holiness of God and the depravity of man caused many to abhor his preaching. Oliver Wendell Holmes described his sermons as "barbaric." Mark Twain called him "a drunken lunatic." D. Martyn Lloyd-Jones contended that"Puritanism reached its fullest bloom" in Edwards, saying, "He preached sermons...he did not deliver lectures." Search the internet for many more of Edward's sermons online. Hyman Appleman was born in Russia to ortodox Jewish parents who moved to America in 1914, Appleman graduated from Northwestern University and from DePaul University and was a trial lawyer in Chicago. At age twenty-eight he was converted to Christianity. His Jewish family then living in Chicago disowned him. His father said to him, "When your sides come together from hunger and you come crawling to my door, I will throw you a crust of bread as I would any other dog." Feeling a definite call to preach, he attended Southwestern Baptist Theological Seminary and became one of the greatest evangelists of his generation. His meetings were large meetings, with hundreds and sometimes thousands of conversions taking place. Dr. Appleman made eight or nine trips around the world and several trips to Russia as an evangelist. It was hard to find a day in his long ministry of fifty-three years that he was not preaching somewhere. He averaged two weeks at home out each year and was the author of some forty books. From Fifeshire, Scotland, this great preacher was know as the 'solar man.' In the pulpit he was like the sun in prominence and power. He led over 400 fellow preachers out of the state church and formed the Free Church in 1843. He was friends with Sir Walter Scott, William Gladstone and Thomas Carlyle, among others. He was thoroughly a Puritan preacher, stressing man's sin and God's grace. He was convinced of the authority of scripture, always honoring the Word. His vocabulary is from a different age and difficult for some to follow, but blessings await the reader who tackles his sermons. R.G. Lee was the longtime pastor of the Bellevue Baptist Church of Memphis TN. He was a great orator and his sermons never failed to show his skill. 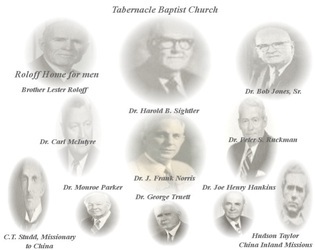 He pastored at Bellevue from 1927-1960. During his pastorate there, over 24,000 people joined the church, over 7,600 of these for baptism. Lee is best known for his sermon, Payday Someday, which he preached over 1000 times. He was born in South Carolina and educated at Furman University in Greenville, SC. His first pastorate was at First Baptist Church of Edgefield, SC where Senator Strom Thurmond and his family were members. It was there that he first preached his Payday Someday message. His style was literary but not deep biblically. He 'painted pictures' with words and his preaching was eloquent and imaginative. One of the great 'Keswick' preachers of England was John Stuart Holden. He was a contemporary of F.B. Meyer and G. Campbell Morgan, but was more popular in many circles of his day. He studied under H.G.C. Moule at Cambridge and became an Anglican preacher. He succeeded William H. Griffith-Thomas at St. and ministered there for 30 years. He was a very popular preacher in North America and made many trips to the U.S. and Canada. He and his wife were booked on the maiden voyage of the Titanic, but were providentially hindered from making the trip. Holden was active in missionary causes like the China Inland Mission. His preaching was vibrant and imaginative. His sermon titles were especially well thought out. in 1914, he preached a message on Daniel 3:18 entitled "But If Not..." which was described as profound and prophectic concerning England's place in the upcoming World War I.
John Henry Jowett was ab English preacher who became known as the "greatest practitioner of the homiletic art of his time." He grew up in a Christian home and always gave credit to his parents for what he became. He also credited his childhood Sunday School teacher as a great influence. His teacher's vivid lessons made a great impression. He pastored numerous great churches in England and crossed the Atlantic to preach in America many times. He was a stylist of preachers who cared greatly for words, so much so that he studied the dictionary as a textbook. His sermons were well studied, but not bookish, always committed to the grand themes of the Christian faith. He was a voluminous writer, with many of his works still in print today. Billy Sunday was a colorful and powerful preacher who preached to hundreds of thousands at the turn of the 20th century. He got his start in preaching by helping J. Wilbur Chapman (see his bio below) in his revival campaigns. Chapman schooled him in doctrine and homiletics. In 1898, he set out on his own to preach. His crusades became regional events, with thousands turning out to hear him. He became as well known as any man in America, including the president. He had been a baseball player before his conversion, and was known in his early ministry as "the baseball evangelist." His preaching against "booze" was one of the main influences for prohibition. He was a conservative and a fundamentalist. Because he was direct in his style and often uncouth, he was accused of being somewhat of a buffoon. Though he used homey illustrations and backyard metaphors, his preaching was filled with the Bible. Many old line preachers despised his aggressiveness and his know-it-all demeanor. It was easy to take shots at a man like Sunday, but no one could gainsay the thousands who accepted Christ after his preaching. Charles Jefferson was a gifted preacher and scholar from Ohio who taught at Ohio Wesleyan and Ohio State University. He pastored the Broadway Tabernacle in Manhattan for more than 30 years, where Charles Finney had labored before him. He was called the "greatest American preacher" by some and was profoundly influenced by Phillips Brooks. He was simple and direct in his style and was penetratingly serious about the ministry and the craft of preaching. His sermons lasted around an hour and were extemporaneous. As the theological wars raged between liberalism and the historic Christian faith, Jefferson found himself in the middle and tried to be a peacemaker. As he aged, his compromise became more and more evident. He began with a sentimental attachment to the old paths, but gradually drifted from complete orthodoxy. John Wilbur Chapman was born to Christian parents who raised him in preparation for the ministry. He publically professed Christ at seventeen and entered college and then the seminary. He pastored several Presbyterian churches before entering evangelism in 1893. He preached with D. L. Moody, Billy Sunday and "Praying" Hyde. He believed in the imminent return of Christ and the inerrancy of Scripture, once advocating his denomination recall all foreign missionaries from the field who did not hold to inerrancy. He possessed a deep and musical voice in the pulpit and a good sense of humor. His sermons were well illustrated and fully applied, and serve as excellent models for today's preacher. Louis Albert Banks was a Methodist preacher from the state of Oregon. He pastored churches in Boston, Kansas City, Denver and Cleveland. He was widely known and published in his time, but, until now, few of his sermons can be found online. He was a dynamic speaker, eloquent and illustrative. Like all great preachers, he took the common truths of scripture and dressed them in direct and vibrant language. The First Methodist Church of Cleveland, Ohio was the scene of his greatest ministry as real revival was seen there for a time. While pastoring in Boston, he ran for governor of Massachusetts on the Prohibition Party ticket. He was a child prodigy who entered college at the age of eleven. The Methodist denomination has declined dramatically in the years since this great man preached, but Banks was true to the Scripture and his Savior. Benajah Harvey Carroll was born in Mississippi and raised in Texas. He was a soldier for the Confederate army and later a general in God's army as pastor of the First Baptist Church of Waco and the founder of the Southwestern Baptist Theological Seminary, still the largest seminary in the world. Carroll was a genuine student of Scripture and a prolific writer. His 13 volume Interpretation of the English Bible is still used by Bible students today. He believed that preaching was the essence of the pastor's duty; he was an expositor in the truest sense. He believed in the authority and the inspiration of the Bible first and foremost. He criticized and chided the "Higher Criticism" teachers as being false brethren. Cyrus Ingersoll Scofield will forever be known as the editor of The Scofield Reference Bible, a study Bible still being used by conservative Christians to this day. But many do not know that he was a soldier for Robert E. Lee in the Civil War, and later a lawyer. Born in Michigan and raised in Tennessee, he was active in politcs after the war in the state of Kansas. Saved at 36 years old, he left behind a life of drunkeness and debauchary. He successfully pastored churches and preached as an evangelist. A serious Bible student, he wrote study courses, phamplets and books. His study Bible was his crowning acheivement. His preaching was practical and memorable. 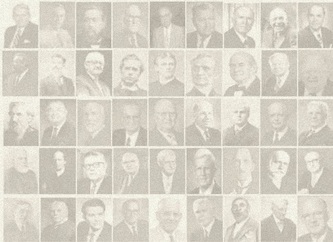 Many of the great preachers of his day gravitated to him such as Moody and Torrey. Scofield's life was a testament to the grace and power of God. Alexander Whyte rose from humble beginnings to become one of Scotland's greatest preachers. His mother and father were unmarried at his birth. His father was unsaved and his Christian mother refused to compound her sin by marrying an unbeliever. Later his father would be saved as a soldier for the Union army in the American Civil War. He was killed at Bull Run. His mother took him to many church meetings as a child and as a young man he was a shoemaker's apprentice. Always a careful student, he seemingly came out of nowhere by preaching in revival meetings of 1859. His preaching caught the eye of educators and he was taught theology by Robert Candlish and others. A shy person by nature, he was like a lion in the pulpit. He preached hard on the depravity of man and the need of salvation. His messages are described as "imaginative, arresting, and awakening." He was very knowledgeable on a variety of subjects and used that knowledge in his sermons. It is said that he studied with Roget's Thesaurus at his elbow. His written sermons stand the test of time and are valuable for the Christian to study today. Spurgeon was a one-of-a-kind preacher. There was never a preacher like him before or since. His story is truly unique in the history of preaching. He started preaching at sixteen and had preached over 1000 times by the time he was 21 years old. Almost immediately, he was a master with word pictures and illustrations. His delivery was like music or poetry and his written word remains as powerful today as it was during his life. Spurgeon's sermons are still printed today and sell as well or better than any contemporary preacher. Though not an expositor in the style of Maclaren, he was thoroughly Biblical in his messages. His thought process was deep, but his preaching was understandable to even the most simple minds. It has been said that his hearers listened as one who was hearing a will read or hearing his sentence given by a judge. Three hundred million copies of his printed works have been in circulation, mostly his sermons. His book on preaching, Lectures to My Students, has had over 500,000 copies printed. His two-volume commentary on Psalms, the Treasury of David, is sitting on the shelves of over 150,000 libraries. During his ministry, he edited a periodical, The Sword and the Trowel, in which he dealt with both theology and politics. Many more of his sermons are available at www.spurgeon.organd other good sites.